ATC SCM20ASL Pro review | What Hi-Fi? The ATC SCM20ASL Pros aren’t the kind of speakers we normally review in the Temptations section of the magazine or online. A contrast to the luxurious real wood veneers and exotically shaped designs with high-tech drive units that pass through our testing rooms, these functional looking boxes are designed as studio monitors, meant to sit on a mixing desk and work hard for their living. In fact, the ATCs aren’t even intended for home use. So, why are we reviewing Pro-orientated speakers here? Well, every once in a while we come across a left-field product that we think you should know about. These are effectively ATC’s SCM19s with a higher-grade tweeter and driven actively, but minus the curved cabinet with a smart real wood finish. While they are very much aimed at the studio world, a closer look at the engineering involved shows that they could shine in a domestic environment too. There are two MOSFET Class A/B amplifier packs in each cabinet: a 200W module to drive the mid/bass and another 50W circuit for the in-house tweeter. ATC is unusual among the smaller speaker specialists in that it designs and builds its drive units in-house, rather than buying in off-the-shelf drivers from OEM suppliers. This has resulted in some seriously engineered drivers, built to withstand plenty of abuse. A highlight is the recently introduced 25mm soft-dome tweeter. It’s a design that has been in development for years and is only now making its way into all the higher-end speakers in the company’s range. 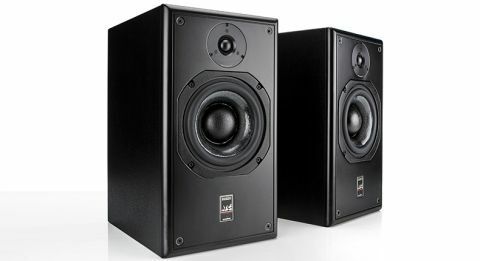 The mid/bass is the same well-proven, robust 15cm unit the company has been using for what seems like decades. It uses a cone made of doped polyester weave onto which a 75mm dome is grafted in a bid to improve the unit’s performance at the integration point. The back panel is more crowded than we’re used to seeing – there’s the mains input and a single input in the form of a balanced XLR. These speakers should be easy to accommodate in most rooms thanks to a bass-adjustment control (working from 80Hz downwards) that alters the quantity of low frequencies in 1dB steps. The range of adjustment is -2dB to +3dB, which proves subtle enough to be useful. Preamp matching is helped by switchable sensitivity and an extra trim adjustment, which means these speakers will be happy to work with a range of partners. Just make sure you like the sound of whatever you connect, because these ATCs – like other speakers from the brand – are ruthlessly honest. If your recording isn’t made with care or your preamp is a bit on the aggressive side don’t expect the ATCs to sound great. The flipside is that when you listen to a great recording such as The Rite of Spring played by the Minnesota Orchestra conducted by Eiji Oue, everything comes to life. The speakers’ stereo imaging is good too. While the soundstage isn’t one of the most spacious we’ve heard, it is precise, focused and stable, even when the piece becomes busy. For a different mood, we play The Dead Weather’s 60 Feet Tall. The ATCs show up the recording’s compressed feel, but also excel at delivering the build-up of tension in the opening. There’s an excellent amount of attack, and we’re impressed with their ability to convey the changing pace of the piece. These aren’t massive speakers. They stand 45cm tall, so really deep bass isn’t an option, but the SCM20ASLs remain seriously impressive at the low-end, delivering bass with weight and power. By high-end standards, these ATCs are terrific value. Getting standmounters and four power amplifier channels of such a high standard is likely to cost a lot more than this. Get past the functional appearance and you have speakers with a performance of rare quality.